I bet you have heard about React, but what about Flux? There are things like react-router, which enables you to create component like routing rules so that you can activate React component for particular route, but what about state and interaction with backend? When developing an Angular app you most likely use ui-router to define and transit between application states and resolve data from server. User then interacts with UI of the current state (controller methods), which may call services up to the server REST endpoints and then receive data to update the UI. React itself will be of little help in such use cases. Facebook’s reasons for developing React and Flux are described in this video: It is important to notice that it is an architecture and not a framework. Facebook uses the Flux architecture internally but as of January 2015, they only open sourced a small example of how Flux can be implemented, which is not what they use in production. 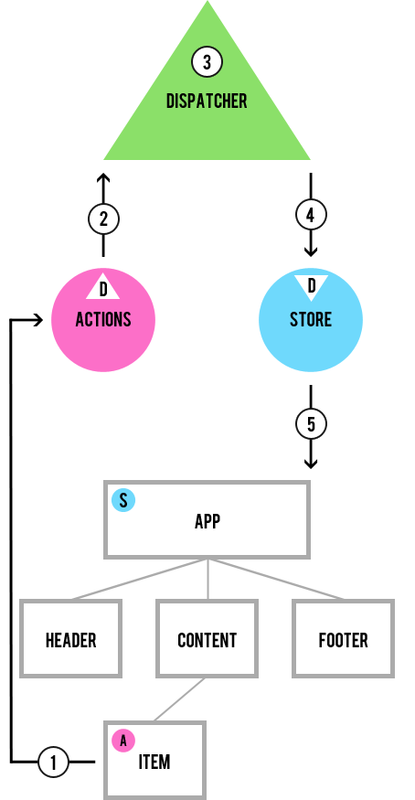 Implementation of Flux should provide application with infrastructure that is not provided by React itself. Let us consider a simple scenario of TodoMVC application example they provided on github – user completes a Todo item by clicking on its check icon. Clicking on the check icon invokes onChange event handler in React component. React component contains reference to TodoActions. Appropriate action is called and all relevant data is passed to the function. TodoActions contains reference to AppDispatcher which notifies all stores which are registered in the Dispatcher about new action, dispatcher is just instantiated because its implementation is provided by Facebook’s Flux. Store contains reference to AppDispatcher and registers a callback for handling dispatched actions (store also decides if it should perform anything based on the action type). In our case store handles TODO_COMPLETE action by updating todo item and emitting change event. To close the unidirectional data flow loop we need to get updated data back to the React components. TodoApp component registed change listener for the TodoStore after component addition to DOM (componentDidMount function). When notified, component executes store’s method to fetch updated data. So far it looks nice. Unidirectional data flow reduces complexity and system is easier to reason about. View layer just renders current state of stores, which are the state holders. Mutation to the state is only performed by calling explicitly defined actions (which are handled by stores). React is a performant, view focused, component based library. In itself, it is not sufficient to build a whole SPA. There are many approaches on how to use React with other frameworks (Backbone and even Angular). 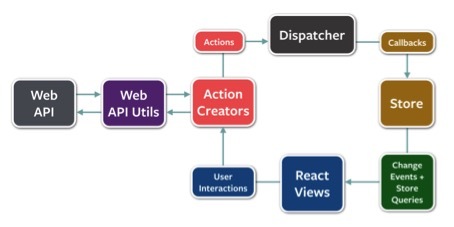 The preferred way of using React (championed by Facebook) is to follow the Flux architecture. There isn’t currently available mature open source implementation of the Flux architecture, which would provide ecosystem of features that are needed to effectively develop SPA as of January 2015. Because of these reasons, React isn’t a sensible choice when developing standard web applications. In special cases it can be employed as a part of an Angular application to handle a high performance load when displaying big data sets although Angular (1.3) provided possibility to use one time databinding (:: expression) which can be employed in those situations.